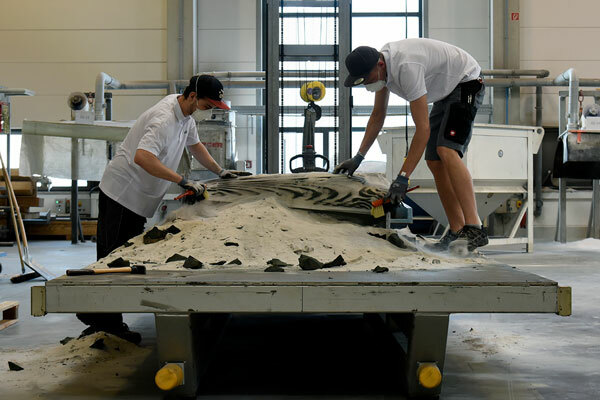 ETH Zurich has installed the world's first lightweight concrete slab with 3D sand printer moulds in its future-oriented research building, the DFAB House in Zurich Dübendorf. Poraver® expanded glass was used as lightweight aggregate for the special glass fiber reinforced concrete formulation for the so-called Smart Slab. Concrete as a building material offers almost unlimited possibilities in the design of architectural elements. This range has been considerably extended in recent years by the invention of 3D printing. 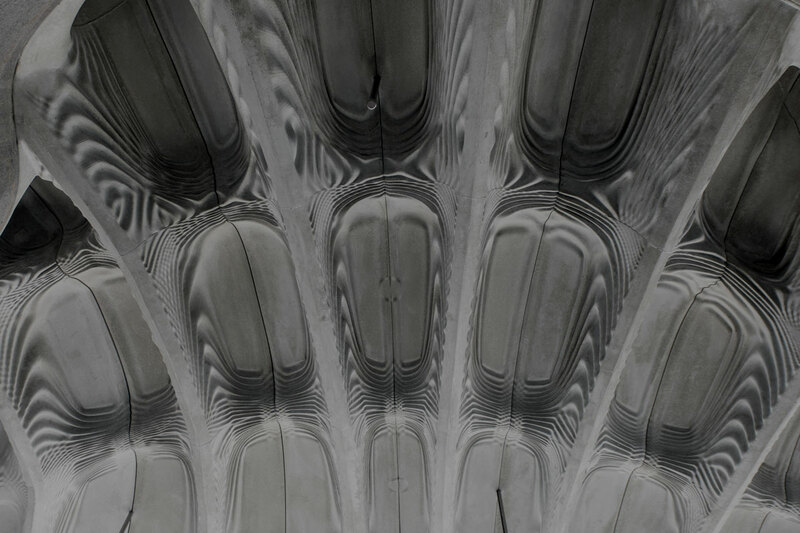 Now a research group led by Prof. Benjamin Dillenburger from ETH Zurich has proven that the possibilities of modern architecture with concrete are far from exhausted. 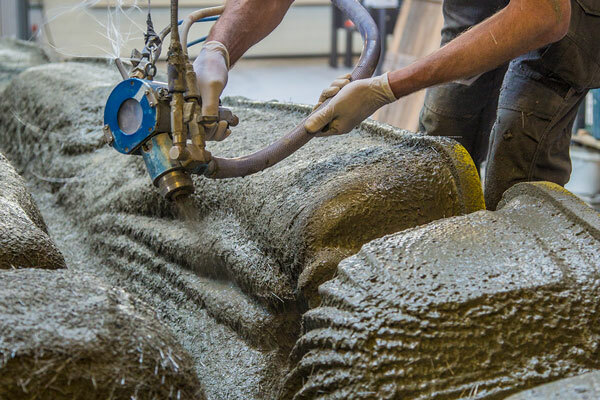 The researchers developed a technique to produce moulds for shotcrete elements using the 3D sand printing process. 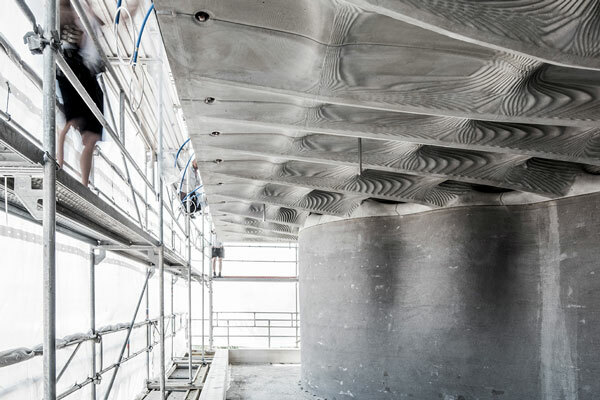 The new completely digitized construction method enables the fabrication of highly optimized concrete components with complex ornamental structures and combines the excellent structural properties of concrete with the geometrical freedom of 3D printing. All injection moulds for the complex ceiling elements of the Smart Slab were created and optimised on the computer. This enabled massive material savings. The software specially developed for production calculated the exact amount of concrete required for each point of the entire construction in order to guarantee sufficient stability. As a result, the Smart Slab, which has a total area of 78 m2, weighs only 15 tons and is only 20 mm thick at the thinnest points. Thanks to the new construction method, about 70 percent of the weight is saved compared to a concrete slab in traditional design. Special lightweight concretes with and without glass fibre reinforcement were used, which combine low weight with high strength. In order to achieve the required low concrete density of around 1,350 kg/m3, Poraver expanded glass was used as lightweight aggregate. The industrially produced granules of recycled glass offer consistent quality and considerably reduce the density of the concrete. The slab consists of a total of eleven concrete segments and connects the basement with the two-storey wooden building above in the NEST research and innovation building of Empa and Eawag in Dübendorf. Bürgin Creations Switzerland was responsible for the technical realisation of the Smart Slab ceiling. 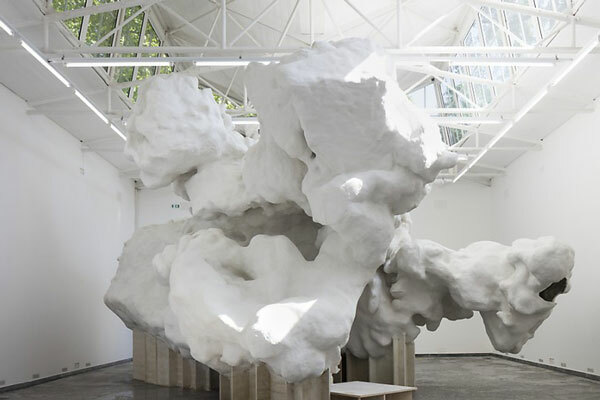 In 2016, Bürgin built the art installation “Incidental Space” by architecture professor Christian Kerez in the Swiss Pavilion at the Venice Biennale. Also in this case Poraver® was the perfect filler for the concrete formulation. Thanks to the polymer shotcrete with Poraver® expanded glass developed by Theo Bürgin, the wall thickness of the elements could be reduced to only 1 to 4 centimetres and with sufficient stability. The positive properties of the modern concrete formulation were tested and confirmed by fracture tests and static studies carried out by Prof. Dr Joseph Schwartz at the ETH Zurich. Thanks to the innovative concrete formulation, the total weight of the 220 elements for the “Incidental Space” was only around 8 tons. The hierarchical ribbed structure of the Smart Slab ceiling. Loose sand particles are removed from the 3D-printed formwork element. The Smart Slab ceiling, which rests on the "Mesh Mould" wall, during the assembly of the wooden structure above. Glass fibre reinforced lightweight concrete is sprayed in several layers onto the 3D-printed formwork. In 2016 Bürgin already used Poraver® expanded glass to improve the special concrete formulation for the "Incidental Space" art installation at the Venice Biennale. A total of 220 individual elements were produced for the art object at the Biennale.